Today I am sharing my newest class the Petal Garden Card Class that I designed using the new Stampin’ Up! Petal Garden Designer Series Paper and the Petal Garden Memories & More Card Pack. As soon as I saw the new Stampin’ Up! catalog, I knew that I had to design a class with this paper. It is so my style! If you are into Shabby Chic, you do not want to miss out on this class! The Petal Garden Card Class provides 12 unique card layouts with all of the pre-cut cardstock and supplies to make 24 unique cards. This is the full class to go kit. It includes the clear mount Graceful Garden Stamp set and all of the cardstock and supplies to make 24 complete cards with envelopes. That includes the pre-cut cardstock, 24 sheets of Petal Garden Designer paper, 1/2 a package of the Memories & More cards, a package of Rhinestone Jewels and 1 yard of each of the 4 Colors of 1/8″ sheer ribbon that coordinate with this paper. This option includes a full color PDF with all of the instructions that you need to make 12 different card layouts. NOTE: There is enough product to make the 12 cards shown on the PDF and a 8″ x 6″ scrapbook. The Petal Garden designer paper would be perfect for a Wedding or shower scrapbook! This option is for those of you that already have the Graceful Garden stamp set or just want to use the sentiments from the Memories & More card pack for all of your cards. This option includes all of the pre-cut cardstock, envelopes, 24 sheets of Petal Garden Designer paper and 1/2 of a package of the Memories & More card pack, a package of Rhinestone jewels and 1 yard of 4 colors of 1/8″ sheer ribbon. This option also includes a full color PDF file with all of the instructions to make these cards. 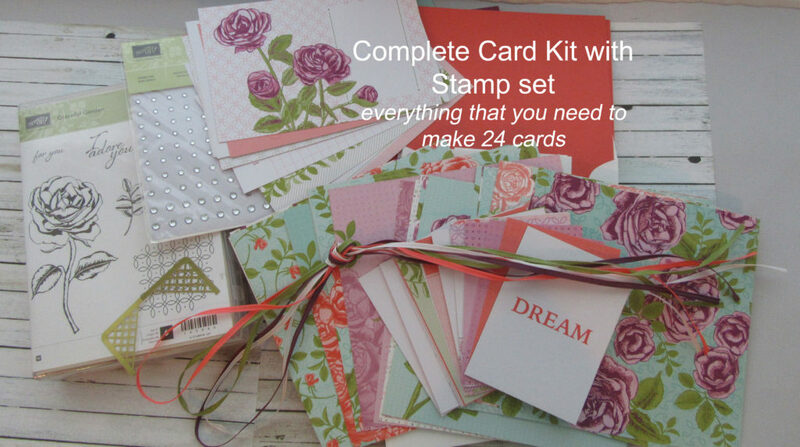 Option 3 – $20 – Full Color PDF with instructions and supply list for making these 24 cards. It also includes all the cutting instructions to prep these cards yourself. All Petal Garden Card Class kits and included product will be ordered and prepped following your order to me (approximately 10-12 days). I do not have the stamp sets or materials on hand to immediately prep the kits and send them out immediately (per Stampin’ Up! policy). I can only ship the Class kits (Option 1 & 2) in the USA. If you live outside the US, you can still order the Petal Garden Class PDF (Option 3) which will be delivered to you immediately upon placing your order. NOTE: The PDF will be delivered to anyone ordering the kit (Option 1 or 2) via email, immediately following your order. Make sure to save this PDF. If you are a Stampin’ Up! Demonstrator you are free to use this class for one of your local events. But please do not sell the class or PDF online. 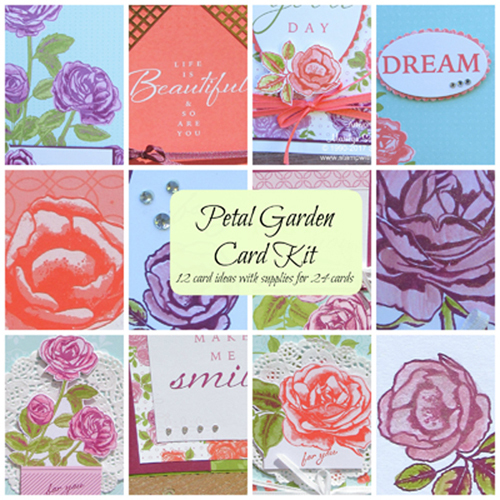 Thank you for stopping by and checking out my new Petal Garden Card Class! Enjoy! Hi. What color ink is used for the cards? Thank you. Rich Razzleberry is used to stamp the flowers… Sweet Sugarplum, Calypso Coral and Rich Razzleberry to color in the flowers. old Olive for the leaves. Thanks for asking!